In the last issue of the project, I reviewed the most recent developments in four countries I have recently discussed – Gambia, Equatorial Guinea, Zimbabwe and the DRC – in all of which long-standing ‘elected dictators’ have refused to stand down, in some cases against growing internal opposition and external pressure, but with significantly differing outcomes. In this issue, I review the recent political history of Niger, where President Mahamadou Issoufou has – by contrast – recently announced that he would not amend the constitution to allow him to seek a third term after his second and final mandate ends in 2021. The Republic of Niger became independent from France in 1960. It is one of the UN’s Least Developed Countries with an average per capita income of less than $2 a day (just under $400 a year in 2015) and is consistently one of the lowest-ranked countries in the world according to the UN Human Development Index (HDI): it was ranked last at 188th in 2014. Most (80 per cent) of Niger – the largest country in West Africa in terms of territory (almost 1.27 million sq kms) – is desert, and even the non-desert regions are constantly threatened by periodic drought. The majority of the 20 million or so inhabitants rely on dry-land farming and pastoralism, with some export agriculture clustered in the more fertile south. The country also exports minerals, especially uranium ore, and is the world’s fourth largest uranium producer. Since 2011, it has also started producing, refining and exporting oil. Output is currently around 20,000 barrels a day, which is about the same as its refining capacity. The country also exports minerals, especially uranium ore, and is the world’s fourth largest uranium producer. Since 2011, it has also started producing, refining and exporting oil. Output is currently around 20,000 barrels a day, which is about the same as its refining capacity. Following the Overseas Reform Act (Loi Cadre) of 23 July 1956 and the establishment of the Fifth French Republic on 4 December 1958, Niger became an autonomous state within the French Community. Having organised a powerful coalition of Hausa, Fula, and (most prominently) Djerma leaders, including chiefs and traditionalists, in support of Niger’s independence referendum, Hamani Diori, leader of the Nigerien Progressive Party (PPN), gained French favour; and on 18 December 1958, after the referendum, when the Republic of Niger was officially created, Diori was appointed Head of the Council of Ministers (the provisional government) of the Republic of Niger. He became Prime Minister of the republic in 1959. During this period, the French government banned all political parties except the PPN, effectively making Niger a one-party state. On 11 July 1960, Niger decided to leave the French Community and it acquired full independence on 3 August 1960 with Diori as its first president. Shortly after independence, Diori made the PPN the only legally permitted party. His government favoured the maintenance of traditional social structures and the retention of close economic ties with France. From the early 1960s, he ruled through a small number of pre-independence notables who sat on the PPN Politburo and largely by-passed even the cabinet. In addition to being both president of the republic and president of the PPN, Diori also directly headed a number of Ministries. From 1960 to 1963 he served as his own Defence Minister and Foreign Minister and again took over the Foreign Ministry from 1965 to 1967. The National Assembly of Niger met in largely ceremonial annual sittings to ratify government policies. Traditional notables, elected as parliamentary representatives, often unanimously endorsed government proposals. As president of the PPN, Diori was the only candidate for president of the republic, and as such was re-elected unopposed in 1965 and 1970 – an early ‘elected dictator’. He gained a worldwide reputation for his role as a spokesman for African affairs and as a popular arbitrator in conflicts involving other African nations. Domestically, however, his administration was rife with corruption, and the government was unable (or perhaps unwilling) to implement much-needed reforms. Increasingly criticized at home for his negligence in domestic matters, Diori put down a coup in December 1963, which occurred concurrently with a border dispute with the Republic of Dahomey (now Benin). He also narrowly escaped assassination in 1965. Faced with an attempted military coup and attacks by members of Sawaba (an opposition movement that, from exile, attempted an abortive guerrilla campaign in the mid-1960s), he used French advisers and troops to strengthen his position. Close links with France led to student and trade union protests against what they described as ‘French neocolonialism’. However, his relationship with France suffered when his government voiced dissatisfaction with the low level of investment in uranium production on the occasion of a visit by Georges Pompidou to Niger in 1972. In 1974, the combination of devastating drought and growing political unrest resulted in widespread civil disorder associated with allegations that a privileged few, including some government ministers and members of Diori’s family, were misappropriating stocks of food aid. On 15 April 1974, Lieutenant Colonel Seyni Kountché led a military coup that ended Diori’s rule. Diori was imprisoned for six years; after his release in 1980, he remained under house arrest until 1987. After being released from house arrest, he moved to Morocco, where he died on 23 April 1989 at the age of 72. The new government led by Seyni Kountché declared itself to be the Supreme Military Council (CMS). Tandja Mamadou – who was later to become president himself – participated in the 1974 coup that brought Kountché to power and became a member of the CMS. In 1991, Tandja emerged as the head of one of two powerful factions in the ruling National Movement of the Development Society (Mouvement National pour la Societé de Développement, MNSD) and at a party congress held in November 1991, he was elected as MNSD President. President Kountché ruled the country through the CMS until his death in 1987. The first action of the Kountché military government was to address the food crisis which was one of the catalysts of the military coup. While political prisoners of the Diori regime were released after the coup and the country was stabilized, political and individual freedoms were strictly limited. The Constitution was suspended, the National Assembly dissolved, and political parties were banned. On the other hand, a consultative National Council for Development (CND) replaced the National Assembly and, although political parties were outlawed, opposition activists who were exiled during Diori’s regime were allowed to return to Niger. Despite the restrictions on civil and political liberties, the country enjoyed improved economic development with the creation of new companies, the construction of major infrastructure (building and new roads, schools, health centers) and minimal corruption in government agencies, which Kountché did not hesitate to punish severely. This economic development was helped by the uranium boom as well as strategic deployment of public funds. Generally amicable relations were maintained with France, and new links were formed with Arab states. Domestically, the country stabilized although personal and policy differences developed within the CMS. Economic development was impeded by the recurrence of drought in 1984 and 1985 and by the closure of the land border with Nigeria from 1984 to 1986. Niger’s dependence on external financial assistance increased. Relations with the United States (by now the country’s principal source of food aid) assumed considerable importance. Meanwhile, a period of renewed tension between Niger and Libya had fueled Libyan accusations of the persecution of the light-skinned, nomadic Tuareg population by the Kountché regime. In May 1985, following an armed incident near the Niger-Libya border, all non-Nigerien Tuaregs were expelled from the country. Seyni Kountché’s health deteriorated in late 1986 and continued to worsen during 1987. He died at a Paris hospital of a brain tumor on 10 November 1987. He was succeeded by his Chief of Staff, Col. Ali Saibou, who was confirmed as Chief of the CMS on 14 November 1987, four days after Kountché’s death. Saibou introduced political reforms and drafted a new constitution, with the creation of a single party. A referendum in 1989 led to the adoption of the new constitution and the creation of the Second Republic of Niger. General Saibou became the first president of the Second Republic after winning the presidential election on 10 December 1989. Saibou efforts to manage political reforms from the centre were opposed by trade unions and student groups which demanded the introduction of a multi-party democratic system. On 9 February 1990, a violently repressed student march led to the death of three students, which led to increased national and international pressure for a National Conference. The Saibou regime acquiesced to these demands by the end of 1990. There were other pressures on the regime as well, including Toubou and Tuareg rebellions in the north, as these groups demanded greater political recognition and a more substantial effective share of the country’s resources. From 29 July to 3 November 1991, a National Conference gathered a wide range of different interest groups to examine the political, economic and social situation of the country and make recommendations for its future direction and development. A transitional government was installed in November 1991 to manage the affairs of state until the institutions of the Third Republic were put into place in April 1993. After the National Sovereign Conference, the transitional government drafted a new constitution that eliminated the previous single-party system of the 1989 Constitution and guaranteed more freedom. While the economy deteriorated over the course of the transition, there were certain notable political accomplishments, including the successful conduct of a constitutional referendum; the adoption of key legislation such as the electoral and rural codes; and the holding of several free, fair, and non-violent nationwide elections. Freedom of the press flourished, with the appearance of several new independent newspapers. Government paralysis and the prevailing political uncertainty were used as justification for a second military coup. On 27 January 1996, Col. Ibrahim Baré Maïnassara led a military coup that deposed President Ousmane and ended the Third Republic. Col. Maïnassara created a National Salvation Council, composed of military officials, which he headed. The Council supervised what it defined as a six-month transition process, during which a new constitution was drafted and presidential elections were held – on July 7–8, 1996 – in which Mamadou Tandja ran again, as did Ousmane. On the second day of polling, however, both Tandja and Ousmane were placed under house arrest along with the other opposition candidates and held for two weeks. When the results of the election were announced, Tandja took third place (with 16 per cent of the vote) behind Maïnassara (with about 52 per cent) and Ousmane (with about 20 per cent). The elections were viewed nationally and internationally as irregular since the electoral commission was replaced during the campaign (not to mention the house arrest of several candidates). Despite this, Ibrahim Baré Maïnassara became the first president of the Fourth Republic. His efforts to justify what were undoubtedly questionable elections failed to convince donors to restore multilateral and bilateral economic assistance; as a result, a desperate Maïnassara ignored the international embargo against Libya and sought Libyan funds to aid Niger’s economy. In repeated violations of basic civil liberties by the regime, opposition leaders were imprisoned and journalists often arrested, and deported by an unofficial militia composed of police and military. In January 1997, following a pro-democracy demonstration, Tandja was arrested along with former President Ousmane and former Prime Minister Mahamadou Issoufou and held until 23 January. On 9 April 1999, Maïnassara was assassinated during a military coup led by Maj. Daouda Malam Wanké, who established a transitional National Reconciliation Council to oversee the drafting of a constitution for the Fifth Republic with a French-style semi-presidential system. A new constitution was adopted on 9 August 1999 and was followed by presidential and legislative elections in October and November of the same year. The elections were generally found to be free and fair by international observers. Significantly, and unusually, Wanké withdrew himself from government affairs after the new and democratically elected president was sworn in office. After winning the election in November 1999, President Tandja Mamadou was sworn in office on 22 December 1999 as the first president of the Fifth Republic. Tandja was of mixed Fula and Kanuri ancestry and was the first President of Niger who was not ethnically Hausa or Djerma. He immediately introduced a number of administrative and economic reforms that had been halted due to the military coups since the Third Republic. Niger was heavily in debt and was not receiving any foreign aid due to the 1996 coup and subsequent suspension of democratic institutions. Tandja focused on economic development, negotiating with the civil service unions and with foreign donors. Many did not approve of Tandja’s measures in reducing government spending. 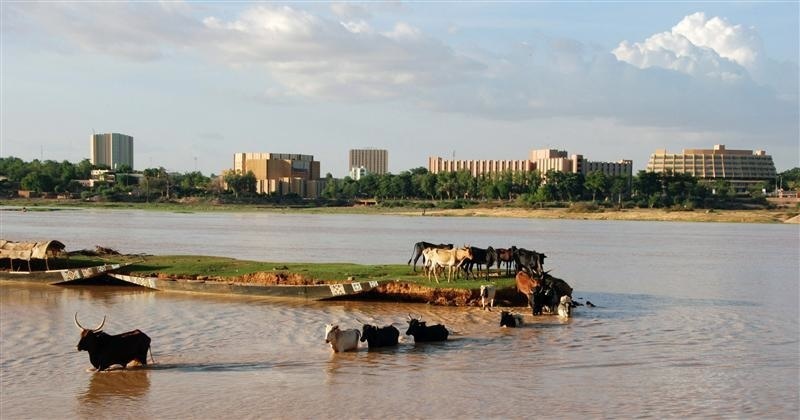 In 2001, students at the University of Niamey staged violent protests against the reduction of their government grants. On 31 July 2002, some soldiers in Diffa started a mutiny demanding pay and improved living conditions; this briefly spread to Nguigmi and the capital Niamey a few days later. Loyalists defeated the mutineers and restored peace by 9 August, but Tandja came under political fire for his decrees blocking communication about the rebellion. President Tandja Mamadou was re-elected for a second term in 2004, thus becoming the first president of the republic to win consecutive elections without being deposed by military coups. From 2007 to 2008, the Second Tuareg Rebellion took place in northern Niger, worsening economic prospects at a time of political limited progress. The political environment actually worsened during 2008 as Tandja and his supporters sought to extend his presidency by modifying the constitution, which limited presidential terms in Niger. Proponents of the extended presidency rallied behind the Tazartche (a Hausa word meaning ‘continuity’) movement, were confronted by opponents (anti-Tazartche) composed of opposition party militants and civil society activists. From the beginning of 2007 to early 2008, the prices of some of the most basic international food commodities increased dramatically on international markets. The international market price of wheat doubled from February 2007 to February 2008, hitting a record high of over $10 a bushel. Rice prices also reached ten-year highs. In some nations, milk and meat prices more than doubled, while soy – which hit a 34-year high price in December 2007 – and maize prices have increased dramatically. Total food import bills rose by an estimated 25 per cent for developing countries in 2007. This inevitably had an impact on food aid: as food aid is programmed by budget rather than volume, rising food prices meant that the World Food Programme (WFP), for example, needed an extra $500 million just to sustain current operations. This created a global crisis and resulted in widespread political and economic instability and social unrest across the developing world in particular. In the period from February to April 2008, there were popular protests in a number of countries across Africa – including Burkina Faso, Cameroon, Egypt, Gabon, Guinea, Ivory Coast, Mauritania, Morocco, Mozambique, Senegal and Tunisia – and Niger. On 30 April 2008, Thailand announced the creation of the Organization of Rice Exporting Countries (OREC) with the potential to develop a price-fixing cartel for rice. This was seen by some as an action to capitalise on the crisis. The prospect of the release of Japan’s rice reserves onto the market had already lowered prices by mid-May. December 2008 saw sharp decreases in the price of staple crops from their earlier highs. Corn prices on the Chicago Board of Trade dropped from US$7.99 per bushel in June to US$3.74 per bushel in mid-December; wheat and rice prices experienced similar decreases. The FAO, however, noting that food prices remained high in developing countries and that the global food security situation had worsened, warned against ‘a false sense of security’, noting that the credit crisis could cause farmers to reduce plantings. By early 2011 food prices had risen again to surpass the record highs of 2008. Some commentators saw this as the resumption of the price spike seen in 2007–08. In Niger, the government weathered the food price crisis and the popular response to it. But the President was about to throw a spanner in the works In March 2008, during meetings with French President Sarkozy, Tandja had explicitly stated that he would not seek a third term. In early 2009, however, he announced his plan to organize a constitutional referendum on the extension of his presidency in order to remain in power at the end of his two legal five-year terms. He claimed that he was responding to the desire of the people of Niger. Despite opposition from political parties and against the decision of the Constitutional Court which ruled in June that the referendum would be unconstitutional, Tandja went ahead with his plans. The referendum would vote on the dissolution of the Fifth Republic and the creation of the Sixth Republic under a fully presidential system of government, offering a yes or no vote on the suspension of the constitution and granting President Mamadou Tandja a three-year interim government, during which the constitution of the Sixth Republic would be formulated. On 20 June, the Constitutional Court declared the plan illegal, but Tandja subsequently assumed emergency powers and dissolved the Court. The opposition boycotted the referendum but a referendum was held in Niger on 4 August 2009; and a new Constitution was adopted with a 68 per cent turnout and 92.5 per cent of voters, according to official results. This resulted in the overturning of the 1999 Constitution, and created a Sixth Republic with a presidential system, as well as a three-year interim government with Tandja Mamadou as president. The new Constitution was declared illegal by the Constitutional Court; but the President dissolved the Court and assumed emergency powers. Political and social unrest grew, however, before, during and after the referendum project, and ultimately led to a military coup in February 2010 that ended the brief existence of the 6th Republic. A military junta led by Captain Salou Djibo was established specifically in response to Tandja’s extension of his presidency by the adoption of a new constitution. The Supreme Council for the Restoration of Democracy, under Djibo (now a General) carried out a one-year transition plan, drafted a new Constitution and held elections in 2011. These were judged internationally as free and fair. In these elections, Mahamadou Issoufou was elected as the first president of the Seventh Republic. Issoufou had been Prime Minister of Niger from 1993 to 1994, President of the National Assembly from 1995 to 1996, and he had been a candidate in each presidential election since 1993. He led the Nigerien Party for Democracy and Socialism (PNDS-Tarayya), a social democratic party, from its foundation in 1990 until his election as President of Niger in 2011. During the Presidency of Mamadou Tandja (1999–2010), Issoufou was the main opposition leader. In 2009, the PNDS and Issoufou strongly opposed Tandja’s efforts to hold a referendum on the creation of a new constitution that would allow him to run for re-election indefinitely. At an opposition rally in Niamey on 9 May 2009, Issoufou accused Tandja of seeking ‘a new constitution to stay in power forever’ and the establishment of ‘a dictatorship and a monarchy’. As leader of the opposition coalition – the Front for the Defence of Democracy (FDD) – he said on 4 June 2009 that a planned anti-referendum protest would be held on 7 June despite an official ban. On 27 June, Tandja assumed emergency powers on 27 June. Accusing Tandja of undertaking a coup d’état, ‘violating the constitution and … forfeit[ing] all political and moral legitimacy’, Issoufou called on the armed forces to ignore his orders and urged the international community to intervene. He was detained at his home by the army’s paramilitary police on 30 June; he was questioned and released after about an hour. A nationwide strike called by the FDD, held on 1 July, was deemed partially successful by the press. The referendum was held on 4 August 2009, despite the opposition’s furious objections and calls for a boycott, and it was successful. Speaking on 8 August, shortly after the announcement of results, Issoufou vowed that the opposition would ‘resist and fight against this coup d’etat enacted by President Tandja and against his aim of installing a dictatorship in our country’. On 14 September 2009, Issoufou was charged with misappropriation of funds and then released on bail. He said that he was actually charged for political reasons. He left the country. On 29 October 2009, international warrants for the arrest of Issoufou and Hama Amadou were issued by the Nigerien government, and Issoufou returned to Niamey from Nigeria late on 30 October in order ‘to cooperate with the judiciary’. In February 2010, Tandja was ousted in a military coup, and the new transitional junta enabled the opposition leaders to return to active politics in Niger while preparing for elections in 2011. At a meeting in early November 2010, the PNDS designated Issoufou as the party’s candidate for the January 2011 presidential election. Issoufou said on the occasion that ‘the moment has come, the conditions are right’; and he called on party members to ‘turn these conditions into votes at the ballot box’. Issoufou won the January–March 2011 presidential election in a second round of voting against MNSD candidate Seyni Oumarou and was inaugurated as President on 7 April 2011In July 2011, a plot to assassinate Issoufou was allegedly uncovered; a major, lieutenant, and three other military personnel were arrested. In April 2013, a court lifted a government ban on opposition marches. On 10 May 2013, it was reported that thousands of opposition supporters staged a protest rally against what they said was the failure of President Issoufou to improve living standards in Niger, one of the world’s poorest countries. The rally, in the capital Niamey, was the largest in Niger since pro-democracy protests against then-President Mamadou Tandja that helped to block his bid to serve a third term and ushered in a military coup that toppled him in February 2010. It was the first public show of strength by the Alliance for the Republic, Democracy and Reconciliation in Niger (ARDR), a coalition of 15 opposition parties formed in October. The ARDR was formed in response to the creation of a national unity government by Issoufou, including breakaway members of MODEN and former president Tandja’s National Movement for the Development of Society (MNSD). Police sources, who asked not to identified, said some 20,000 people attended the rally, while organizers put the figure at 30,000. The National Police said in an official statement around 5,000 demonstrators took part. ‘Mahamadou Issoufou promised an end to food insecurity but the population continues to be decimated by hunger and thirst’ said Amadou Hama, president of the National Assembly whose Nigerien Democratic Movement (MODEN) who had broken away from the ruling coalition that year. Hama and MNSD leader Oumarou Seyni were widely regarded as the main challengers to Issoufou for the 2016 presidential election. On 7 November 2015, the PNDS designated Issoufou as its candidate for the 2016 presidential election. In February 2016, Issoufou won 48 per cent of the votes in the first round of the elections. As no candidate obtained a majority, a second round was needed. A coalition of opposition parties boycotted the second round. Issoufou subsequently won with 92.5 per cent of the votes. The Constitution of Niger currently limits the president to two terms of five years. Issoufou, 65, was re-elected in March 2016, following the end of his first term, albeit in elections boycotted by the opposition. On 2 April 2017, Issoufou announced – in an interview on state television on the occasion of the first anniversary of his inauguration for his second mandate – that he did not intend to seek re-election in 2021. ‘One of my greatest ambitions is to organise free and transparent elections in 2021 and pass the baton to another Nigerien whom the Nigeriens will have chosen’, he said. ‘I am a democrat at heart (…) I don’t have the arrogance to think that I am an irreplaceable providential man’, he added. If he keeps his word, then he will be the first democratically elected president of Niger to ensure a peaceful transition of power to a new head of state. We shall have to wait and see. For, as The Economist remarked on 26 November 2016, in an article on the US military presence in Niger: ‘though a staunch ally of the West, Niger’s president, Mahamadou Issoufou, is no exemplary democrat. He was re-elected in February, but only after the opposition boycotted the second round of the vote. His main opponent was locked up and then fled the country for exile abroad’. David Seddon (criticalfaculty1@hotmail.co.uk) is a researcher and political activist who has written extensively on social movements, class struggles and political transitions across the developing world. Featured Photograph: the skyline of Niamey, the capital of Niger, July 17, 2007.